LONDON—More armed police officers will patrol the streets of London, authorities said Wednesday, as part of a string of measures taken by the U.K. aimed at ensuring the country is prepared for the types of attacks by Islamic extremists seen elsewhere in Europe. 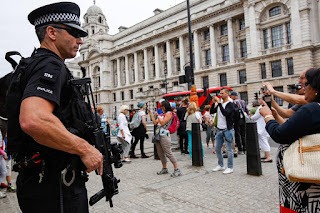 London’s Metropolitan Police, known as Scotland Yard, said the previously-announced extra armed officers were now ready to be deployed in the capital and that they would be on visible patrol, including at well-known landmarks. In the U.K. more than 90% of police officers are unarmed, with only specialist firearms teams permitted to carry submachine guns and pistols capable of killing a hostile suspect. Atrocities like those carried out in France, Belgium and Germany over recent months has demonstrated new methods of attack by jihadist militants, from multiple mass shooters to lone assailants using heavy vehicles as weapons. That has left authorities across Europe scrambling to adapt their efforts to counter such attacks. U.K. authorities in January, following the massacres in Paris last year, said they would increase the ranks of 2,200 officers in London trained to handle weapons by 30%, or 600. In total, the U.K. plans to train an additional 1,500 officers to handle firearms by the end of 2017, more than a quarter of which will be stationed in cities outside of London. “The reality of having to deal with armed and deadly attackers is that you need firearms officers who will use force to stop those attackers in their aim,” Metropolitan Police Commissioner Bernard Hogan-Howe said Wednesday. Earlier in the week, Mr. Hogan-Howe said it was “a case of when, not if” the British capital was struck by an attack. A media blitz by senior Met officials, timed to coincide with the police deployment, gave Londoners their first look at the new armed response teams. Images broadcast on local television showed elite response teams clad in body armor and armed with assault weapons sitting astride specially-modified motorbikes.